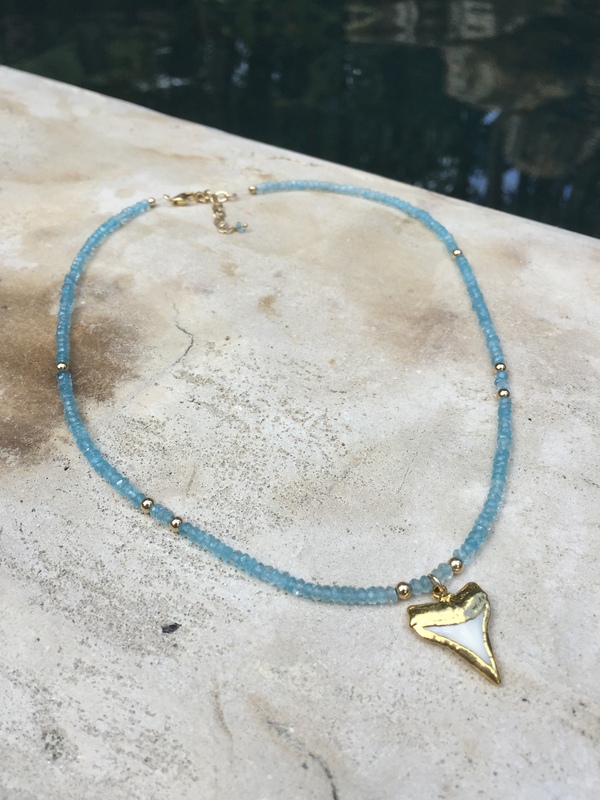 Unique genuine shark tooth necklace made entirely of Blue Topaz stones. There are small gold filled beads throughout the necklace to add a touch of contrast. The shark tooth is a genuine tooth with 24k plated edges. Necklace measures 16.5″ with a 1.25″ extension chain. Please notify me if this needs to be customized. We use USPS First Class Mail and will provide a tracking number for you. If you want to purchase insurance or upgrade to Priority Mail, please contact me and I will send you a seperate invoice through Paypal. INTERNATIONAL ORDERS: All orders are shipped USPS First class mail. This does NOT include a tracking number or insurance. If you would like a tracking number, it is and additional $14.50. If you are ordering multiple items or items of value, it is a good idea to at least get a tracking number. Once I ship, I am not reponsible for lost or stolen packages. If your order exceeds $150, I will include a tracking number at no charge.